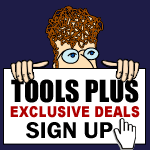 Tools-Plus offers 1000's of power tools and professional hand tools for sale. For over 30 years, Tools-Plus has been the power tools choice for both high level construction trades and every day craftsmen. We've been in business for over 35 years and have built a reputation for personalized service. We are real people that pride ourselves on keeping our customers happy. Our technical staff has accumulated a wealth of knowledge regarding selection and use of all types of tools and machinery. We offer the lowest prices possible and have a lowest price guarantee. We have a 5-Star customer service rating and are rated A+ by the Better Business Bureau. 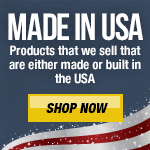 Our shipping turnaround time is ultra-fast, most orders placed before 1 PM EST ship the same day. We ship internationally and to APOs and FPOs. Because who could say no to this face? Eric Savelle's Pledge: For years, a craftsman's hand tools and woodworking tools have been his main means of earning a living. They were a huge investment in time and money, either being made by himself, or purchased from specialist manufacturers and suppliers. The cost of a fully equipped tool chest in the late 1700's was about a year's wages for a skilled crafstman. That is why many older tools are stamped with names and initials, and sometimes there are several sets of names as valuable tools were passed down from generation to generation. To equip a Tool Chest or a Workshop today with Power Tools and Woodworking Tools is still expensive. Maybe not a year's salary, but during these tough economic times saving money is a necessity. Eric and Tools Plus understand, and that is why we Pledge to give you the absolutely best possible price and customer service of any website.